Gorkha Janmukti Morcha president and GTA chief executive Bimal Gurung, his wife Asha, Roshan Giri and 15 others of the party today surrendered before the chief judge of city sessions judges court in Calcutta in the Madan Tamang murder case. 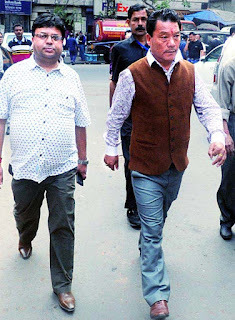 The chief judge, Subhra Roy, granted bail to them with surety bond of Rs 10,000 each and directed them to be present in Calcutta during the trial of the case. Twenty-three Morcha leaders and activists were charge-sheeted in the case. They had been given anticipatory bail by the high court on December 14 and asked to surrender before the trial court in three weeks. "Actually, my clients will have to be present in the city on or before February 1 when the trial court will frame charges against them," Sayan De, the lawyer appearing for Gurung and others, said after the surrender. De told the chief judge that a division bench of Calcutta High Court had granted his clients conditional anticipatory bail. "My clients are ready to obey the conditions imposed by the high court division bench," the lawyer said. The CBI counsel did not raise any objection and the judge granted them bail. After the surrender, Gurung called on Bengal governor Keshari Nath Tripathi at Raj Bhavan and requested him to ensure that elections to four hill municipalities were held as early as possible. The tenure of the Darjeeling municipality came to an end today and by this week, the municipalities of Kurseong, Mirik and Kalimpong will also be administered by the state government-appointed administrators. Gurung was accompanied by Giri and five other Morcha leaders. "Our president has requested the Bengal governor to ensure that elections to the hill municipalities are held early. We have also requested the governor to help form a committee to look into the demand of Gorkhaland which the Centre is positively considering," said Giri.